From Friday 12th February and Sunday 14th February 2016 the second International Gasshuku took place. 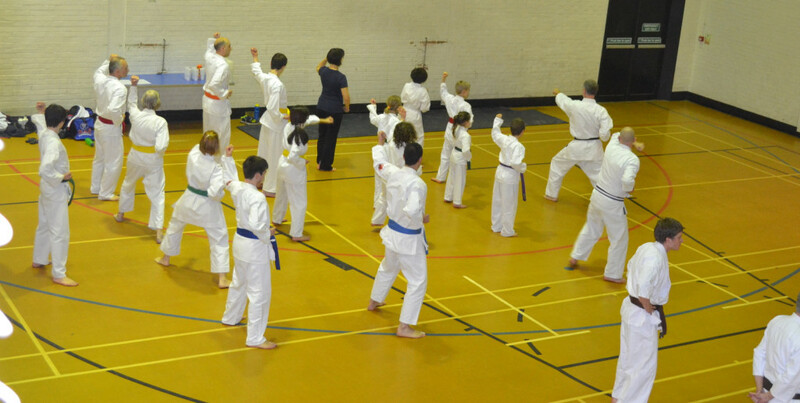 In 2015 the venue was Wantage, Hombu to the Vale Karate clubs. This year it was to be hosted by the Belgian contingent and so karateka from Italy and England travelled to Bruges in Belgium. The proceedings started at 18:00 on the Friday with an instructor’s gathering where we could meet each other and introduce ourselves. The aim of the Gasshuku has always been to be an inclusive and truly non political event, provided for the sole aim to pass on the love of karate by some exceptionally skilled karate instructors. So many groups claim to be non political but the Gasshuku demonstrably is: instructors and students from various JKA groups, the KUGB, the TSKA and SKIF joined together with no airs or graces and no feeling of superiority. When not teaching, the instructors took to the lines to train, acknowledging that we are all students of karate, no matter how much experience we may have. Last year one of the Gasshuku instructors, Sensei Paul Mitchell, said to me that we either learn or die. This is also my belief and it was evident that the instructors at this Gasshuku were certainly not dying! It was an incredible mix. Each instructor had between 20 and 50 years experience. Some had a traditional focus, others a more practical approach and many had a strong competition background with World, European and National championship titles in kata and kumite (as well as a winner of the prestigious Nakayama Cup)! The classes were split into four groups: black belts, brown belts, colored belts and children, so that instruction could be aimed appropriately, and the lessons started. After the initial warm-up, the Dan grades were treated to an initial session by Castellaro Sensei. We started off with some brown belt level basics, but of course performing them as Dan grades, so excellent focus, speed and timing were required. After just a few minutes of this I started to ache but then heard the inevitable word “faster”. You can soon get to hate that word! After a drilling in this we moved on to some kata practise – Heian Shodan first. But obviously, being the senior class, Castellaro Sensei wasn’t about to allow us an easy ride of things (as if – no kata is ever an easy ride if performed with the correct attitude), so we then proceeded to perform this kata ‘ura’, I.e. Mirror image. 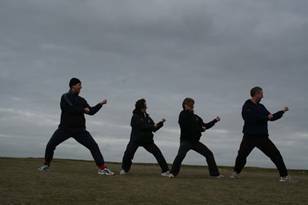 I personally practise that a lot so it wasn’t too much of a problem, but we were then required to do the same with Bassai Dai – now there’s a kata I don’t practise ura much. We finished the session looking at some more advanced applications of shuto uke, Castellaro Sensei demonstrating them with typical panache. There are two key elements to the Gasshuku. The first, obviously, is to foster international cooperation between karate groups and to share training techniques, ideas, and inspiration. The second is to make new friends and renew old friendships and so after training, a large group of us visited an all you can eat Asian restaurant. We ate, drank, talked, laughed and socialized for the rest of the evening. Training on Saturday consisted of lessons by the English instructors (at least for the Dan grades) and first up was Jerome Sensei. The focus of this lesson was to use a “relaxed heaviness” to speed up our techniques without losing any power, and we did this with partners using various combinations, all seemingly simply but with many subtleties that differentiate a good practitioner from an excellent one. On each technique it was emphasised we should strike “through” the target, rather than merely at it. During the second session, Parnell Sensei took the black belts through Kata Senka while I took the brown belt group through Kata Jion. We practised it a few times to make sure everyone knew it well enough, examining some of the detail in the kata before looking in more detail at its bunkai. I have long felt that the standard bunkai offered to many kata is actually worse than useless and counterproductive so I try to teach something that I feel would actually work or at least provide ideas that would work in practise. I was to take the third senior session of the day. 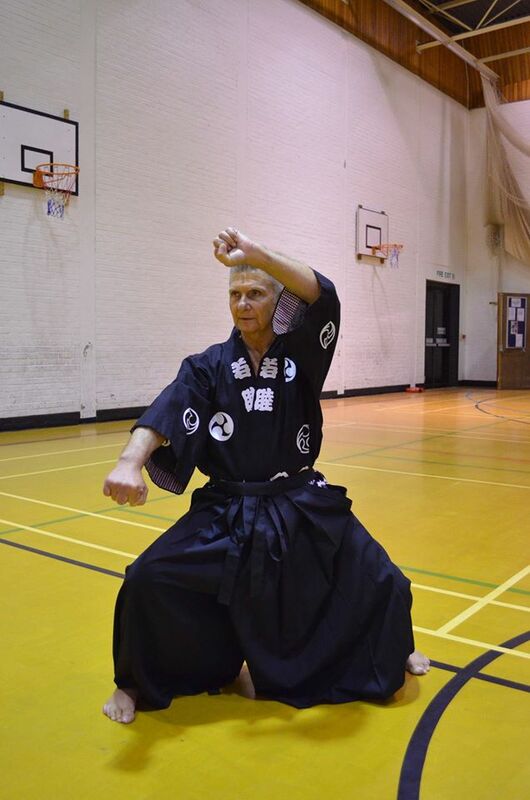 I started with neko ashi dachi, looking at the transition to the stance and correct body posture and alignment. I then went on to get the class performing more advanced defence to the standard jodan and chudan punches we begin to learn as karateka: I like that, because it ties in what we practise as beginners with what we should be practicing as advanced karateka, reminding us of our beginnings. Finally, I finished with an advanced kata – Junro Yondan – showing how the previous elements of the lesson were intertwined closely with the kata itself. That afternoon, a group of us took a walk to Bruges where we felt we had to consume some of the things Belgium is famous for – chips, waffles, and Belgian beer. There have to be some vitamins in there somewhere, eh? The evening’s socialization was at the bar attached to the leisure centre where a barbecue had been arranged. We ate, drank, laughed, sang, danced (yes, danced) and made merry until one by one we staggered to our beds ready for the final days training. The senior grades started with a session from De Cloedt Sensei. I had hoped he would be (and indeed asked him to be) gentle on us, but it was not to be. We started with kumite drills as a warm up, and after several iterations of those we were fully warmed up! We then proceeded to work on tai sabaki, again changing partners frequently, building up some seemingly simple sparring techniques into those that though they seemed simple were actually very complicated. With each new drill we were treated to De Clout Sensei demonstrating what he wanted with an enviable grace. How does he move so well? The final senior session was with Van De Walle Sensei. For the last ten years he has been coach to the Belgian national team and it showed. He had a knack of keeping everything light and exceptionally friendly but with a background feeling of knowing you needed to perform for this man. We practised more kumite techniques. When he demonstrated, the speed with which he moved was so blazingly quick it was almost dream like. I have trained with a few who possessed that speed – like Brennan Sensei. Enough said. All too soon the second International Gasshuku was over. Once again, the standard shown by the instructors was incredible, the enthusiasm of the participants exceptional and the welcome by the host nation humbling. I personally want to thank everyone who taught, trained and helped organize the event. It really demonstrated karate at its best, with plenty of international cooperation and no egos at all. The third International Gasshuku is already being planned. Personally, I can’t wait! Well done to all those who took part last night in the Vale Karate Pop-up Competition. After the event, someone came up to me and said that though they had lost they were okay with it. That was a bit of a shock to me – because, though they had not received a prize, they hadn’t lost! I’m not talking about some politically correct mumbo jumbo where “everyone’s a winner”. I think that is twee and life just isn’t like that. Yet to my mind, every single participant last night won. Let me explain. 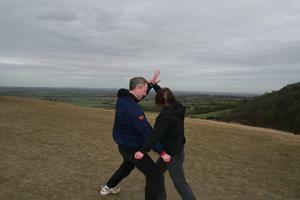 We start practising karate for a number of reasons: some (most?) to learn to fight or at least to defend ourselves, some because our children or friends are doing it, some to get fitter, meet people, gain confidence, co-ordination, etc., etc. Those that continue karate long after their initial objective has been met often do so for different reasons, and that is one of the true beauties of karate: it provides the practitioner with so many benefits and if your mind is open then there is always something to learn. Karate has many facets and one of those is competition. Some may not like that facet, believing they are not good at competition or that is not one of the reasons for their practise of the art. Some may go further and feel that competition devalues the essence of karate which is, of course, martial in nature. But it is still present, and not liking it doesn’t make it go away. I’m personally not a huge fan of competition myself, but – and this is a big but – I believe it can bring enormous benefits, and I’m not just talking about something for the wall or something to hang around your neck. Participating in a competition puts you under a lot of pressure. You are in an essentially alien environment and have to focus on the task at hand. You cannot be put off by spectators. You need an awareness of your surroundings. You need to keep calm and not go to pieces under pressure. These are skills that are useful in many aspects of life, like working to a deadline on a project or, indeed, defending yourself from attack. Many who competed last night did so against their nature and experienced some fear about the process. And in doing so I think they gained a lot. John Wayne is credited with saying Courage is being scared to death but saddling up anyway. So congratulations to all those who saddled up last night. Most didn’t win a prize, but I think you gained something far more important and long lasting. While visiting Nevada in November 2008 I took the opportunity to train at a local traditional Shotokan Karate Club. I originally made contact with the club’s instructor, Sensei James Tawatao through their impressive web site (www.lvshotokan.com). Their purpose built dojo was located a few minutes from the famous Las Vegas Strip. The varnished wooden floor training area was approximately 10m by 10m, mirrored and equipment with makiwara and free standing torso striking posts. I trained at two adult lessons, one for mixed grades and the other for brown and black belts. I could not have made a better choice. Both the Instructor and students made me feel very welcome and the training regime was very high quality authentic shotokan. Sensei Tawatao very kindly agreed to be interviewed following one of the training sessions. A very enjoyable eye opening evening was had which was interspersed by additional contributions from two other club members which ran into the late hours on the rights and advantages of ‘carrying’ and ‘toasting’ any aggressors as a first resort rather than waiting for the distance to be closed! (But that’s another story). My Instructor, Master Osamu Ozawa was born in 1925 in Kobe, Japan. His family is believed to have descended from the famous Takeda samurai clan lineage. He started his karate training at the age of thirteen in December 1938 under Kenwa Mabuni, founder of the Shito-ryu karate. He trained under Master Mabuni for two years. In March 1942, at the age of 17, Master Ozawa entered Hosei University and was introduced to Shotokan karate when he joined the university karate team. In September 1944, Gichin Funakoshi promoted Master Ozawa to Shodan. In October of 1944, Shihan Ozawa was drafted into the Japanese Navy where he enlisted as a Kamikaze pilot. In July 1945, Master Ozawa along with four others climbed into their planes to meet their final destiny. His plane crashed shortly after take off resulting with a punctured lung, broken eardrums and partial loss of vision. Slowly recovering from his injuries, Master Ozawa decided to go back to Hosei University in November 1946. He also started karate training again at the university. He graduated from Hosei University in March 1948 with a degree in economics. In April 1949, the first organized collegiate karate demonstration was held in Tokyo where Master Ozawa and other legendry karate-ka met to discuss the future of University karate. Contributors included Isao Obata, Fusajiro Takagi and Shuntaro Itoh from Keio University, Masatoshi Nakayama, Masatomo Takagi and Hidetaka Nishiyama from Takushoku University, Taiji Kase from Waseda University, Genshin Hironishi, Hiroshi Noguchi and Shigeru Egami from Senshu. At this meeting, the foundation was laid for the formation of the Japan Karate Association. Master Ozawa continued to be actively involved and in 1953, the JKA was organized and received official government recognition as the karate governing body for Japan. In November of 1954, Master Ozawa sponsored the biggest budo demonstration of its time in Japan held at an auditorium in Kobe. Over 10,000 spectators came to watch the demonstration by such prominent instructors such as Master Nakayama who later became the technical director of the JKA, Master Okazaki, and many others. Shortly after his successful karate demonstration, Master Ozawa was officially appointed the Chief Instructor of the Kansai branch of the JKA, which consists of Osaka, Kobe and Kyoto and also passed his 4th degree black belt. In May of 1962, Master Ozawa received his 5th degree black belt diploma from Mr. Takagi, the Managing Director of the JKA. In December 1964 Master Ozawa arrived in the US and subsequently opened a dojo in San Gabriel, California in 1967. In 1974 he moved to Las Vegas, Nevada and opened the honbo dojo in 1981. A month before opening, an inaugural Traditional Karate Tournament with only 30 competitors was held to publicize and promote the new dojo. This annual tournament has grown to be one of the largest and most prestigious tournaments of its kind in the world. At its peak the event has attracted more than 2000 competitors from 25 to 40 countries. During the January 1986 tournament, the International Martial Arts Federation (IMAF) delegate from Japan presented Master Ozawa with his 8th degree black belt. Prince Higashikuni, president of IMAF and uncle of the emperor Hirohito signed the certificate; this was especially significant to Master Ozawa. Only four other people had ever been honored with such a certificate – Hironori Ohtsuka, founder of Wado-ryu karate, Gogen Yamaguchi, founder of Goju-ryu karate, Hiroyuki Ohtsuka, successor to his father as head of Wado-ryu and Hirokazu Kanazawa, the head of Shotokan Karate International. In 1995, Master Ozawa passed the responsibility of the dojo’s future to me, in conjunction with 3 other senior grades. In April 1998, Master Ozawa hosted the 18th Annual Traditional Karate Tournament but two days later died of natural causes. The large annual tournament is now known as the Ozawa Cup international tournament and continues the legacy of Shihan Osamu Ozawa. Sensei, from my own experience of over 20 years training in the UK with a number of the large associations I have never witnessed the reciting of the dojo kun. Each of these associations has been party to either first or second generations of Japanese instruction and periodically host Japanese instructors. Despite this, the reciting of any code of ethics has been missing and generally I believe is very rare. Can you tell me a little of your own Dojo Kun and how it is applied. Jinkaku kansei ni tsutomu beshi – Endeavour to build your character. This ideal states that priority should be given to building one’s character rather than strength, speed, technical skill or fighting ability. Makoto no michi o mamoru beshi – Have fidelity in seeking a true way. The ‘way’ should not be a route of self indulgence, weakness or a victim of their own commercial, ego or elevated rank fantasies. Doryoku no seishin o yashinau beshi – Cultivate a spirit of endeavor and perseverance. Training should never be treated as an amusement or a distraction from life’s serious aspects. Those in a hurry to get results seldom learn quickly. Reigi o omonzu beshi – Always act with good manners. This can avoid inflaming poor situations but should not be considered a weakness. According to the teachings of Confucius acting with good manners should be a reciprocal process. Kekki no y o imashimu beshi – Refrain from violent and uncontrolled behavior. Force may be used if morally correct for self defense or protection of the innocent. These concepts point the way towards the ultimate aim of training which is mastery of one’s self. It should be chanted with strength and never mumbled insincerely so that the oath penetrates the mind of all participants. Technique is on no importance as the spirit must be developed and disciplined allowing the karate-ka to begin to make progress in the ‘way’. Sensei, I noticed that the senior kyu grade attending the adult beginners and intermediates session was wearing a blue belt. Please would you describe the belt hierarchy. Within our grading structure the colour of the belts gradually darken as the student progresses. Having achieved black belt status, with time the colour of the belt fades returning to white and the circle (of life) is complete, emphasising the need for the experienced karate-ka to maintain the mind of a beginner. Sensei, please tell me a little about your club, its affiliations, and your sources of continual learning. Our purpose built dojo was opened in 1981. I together with 3 other Seniors and a number of Assistant Instructors teach 7 formal adult, 4 child and 2 new student orientation classes every week amounting to a little under 20 hours in total. The club is predominantly made up of adult members and totals around 100. This is a little on the low side compared to historic numbers of about 130. There has been a proliferation of other Martial Art clubs being established in Las Vegas and it probably now amounts to 150+. I do not teach at any other locations or have any satellite clubs. The Las Vegas Shotokan Karate Club is a stand alone organization and is not a member of any other larger association. However our links and credibility established by Shihan Ozawa is second to none. I am mentored by Sensei Takayuki Mikami1 and Sensei Fumio Demura2 both of which are honored guests at the Ozawa Cup. Members of our dojo and I attended a Hokubei Karate-Do Shihankai Budosai (Japanese Karate Masters Association of North America) seminar last month. This featured courses by Master Mikami and Master Morio Higaonna (Goju Ryu). Both of which lined up and trained as the other taught. Sensei, you mentioned your very popular international competition earlier in the interview. Please can you tell me a little more about the event. The 2008 event, held in March of this year was the 28th continuous competition that Las Vegas Shotokan Karate Dojo has hosted. The event has always been very well supported by a number of different styles and a significant number of very senior instructors. It has come a long way since the inaugural event that attracted just 30 competitors and 6 instructors. At its peak 2000 competitors from 30 countries have taken part over the four day event. This is testament to the respect and appreciation that Shihan Ozawa had within the karate international community. This year’s schedule of events started on a Thursday with registration and a lecture by Sensei Demura. Friday included two further seminars from notable seniors followed by the Ozawa Cup Banquet. Tournament events started on the Saturday with the completion of all Kyu events and the elimination rounds for Dan grades. A children’s Easter egg hunt preceded the Dan grade finals on the Sunday. Categories included Japanese and Okinawan kata, Shobu Ippon kumite for the preliminaries followed by Shobu Nihon kumite for the finals, WKF kumite and Kobudo for both individual and team events. As you can see from the tournament brochure the Ozawa Cup is a massive event and is very well supported through sponsorship. It occupies a significant amount of my time throughout the whole year to organize and is never far from my thoughts. Incidentally Sensei Aidan Trimble and members of his Federation from the UK has attended the event in previous years. Sensei, I would like to thank you and your students for your kind hospitality. I would like to reciprocate your kindness and offer you or your students the opportunity to visit my Dojo near Oxford in the UK if the opportunity ever materialises in the future. – Sensei Takayuki Mikami 8th Dan Shotokan karate. Recognised as the first graduate from the JKA Instructor’s programme established under Masters Nakayama and Funakoshi. Named as American Instructor of the year in 1990, elected President of Japanese Karate Masters Association of North America from 1995, and Chief Instructor of JKA American Federation from July 2008. – Sensei Fumio Demura 9th Dan Shito-Ryu Karate. Renown for his kobudo abilities (weapons). Many film appearances including the Karate Kid series. Chief Instructor of Shito Ryu Itosu Kai USA and President of Shito Ryu Genbu Kai International. In April of this year (2011) I was fortunate to be able to spend a week on the Belgian coast in Knokke Heist, and whilst there I took the opportunity of contacting the local Shotokan club (Nippon Karate Knokke Heist) to enquire about some karate training. I was told I would be very welcome to turn up with gi and train – and so I did. My first evening’s training was the Tuesday “over 30” session led by Sensei Wim. I introduced myself to him before the class and was immediately introduced to all those assembled in a warm and friendly manner. The oldest in the class was over 70, but you would not have known this from his karate, which he practiced with gusto. I was a little concerned (only a little) that language might have been a problem, since I speak very little French and no Flemish at all, but it turned out that it was not a problem at all – everyone spoke very good English when needed, and of course oi tsuki is oi tsuki wherever you go. The club’s dojo is a nicely lit room in a very decent sport center in Knokke Heist with a very good sprung floor. If I ever felt that an “over 30 class” (my first, by the way – a nice idea) was to be an easy class that feeling would soon be dispelled. After a good warm up and stretch, Sensei Wim took us through some basic oi tsuki and then uchi ude uke followed by gyaku tsuki combinations in kokutsu dache, stepping forward and then back. This was followed by partner work (in threes, with one in the middle) practicing using the uchi uke to block a partner’s oi tsuki and then striking the partner with a gyaku tsuki. We then practiced juji uke gedan followed by juji uke jodan, continuing with tetsui then oi tsuki, first on our own and then with a partner providing attacks that we were able to block and counter. By this stage, of course, it was obvious that a particular kata was looming. We finally moved on to a shuto gedan uke / gedan nukite / manje gamai combination, first individually and then again with partners. Then all this was put together in Heian Godan which we practiced first slowly and then quickly. All too soon the lesson had ended, but this was not to be the end of the evening. It is a tradition for those present to head upstairs to the sport center bar after training for a chat and a beer – and as those who know me will verify: I am always one for tradition. A couple of Belgian Beers later I cycled back to my accommodation, feeling very much more tired than when I arrived. On the following day it was the turn of Sensei Stephanie to take the class. Again I received a very warm welcome and found her English to be excellent (as was the English of everyone in the club – putting second (third?) languages of the Brits to shame). 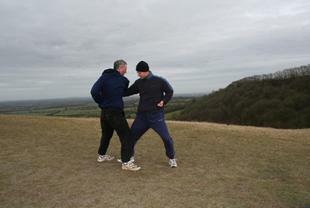 After a similar warm up and stretch we started with some basic oi tsuki punches and then mae geris. I have generally found that if an instructor introduces kicks into a lesson early on then I know two things about them. They like kicking and they are invariably good at them, and this was certainly true of Sensei Stephanie (though this should not have come as a surprise since she is an ex world kumite champion). After ushiro ashi mae geri we moved on to mae ashi/ushiro ashi mae geri and then a similar suite of kicks with mawashi geri. Then on to partner work. Sensei Stephanie had been joined by Sensei Peter, the instructor of the nearby Brugge club (a member of the Belgian national team) and I was fortunate enough to be assigned him as my training partner. We started with oi tsuki attack (partner step back and block with nagashi uki), step back and block with nagashi uki (partner oi tsuki) then oi tsuki (partner step back and block with nagashi uki followed by gyaku tsuki). We then practiced mawashi geri, ura mawashi geri and ushiro mawashi geri, all jodan with our partners providing the necessary targets. It was great to have a partner who could so obviously kick well but who also kicked with excellent control, inspiring me to try to match his speed and accuracy. Every now and then Sensei Stephanie would stop the class to demonstrated some aspect of the kicks, which she performed with speed, grace and an obvious underlying strength – if I were to use one word to describe her kicks I think it would be panache. (At this stage it would be remiss of me not to mention Ellie, just turned 9, just turned 3rd kyu. Though she had never before practiced ura mawashi geri, let alone ushiro mawashi geri, she nevertheless just “went for it”, ably helped by Sensei Stephanie. Though she ended the class very tired, her attitude and spirit was something many children – and some adults – could learn from). After this partner work we split into pairs for some jiyu kumite work. I started with Sensei Peter and thoroughly enjoyed his technique, sometimes defensive, sometimes offensive, always controlled and good spirited. After a little while we swapped partners and I was treated to a spar with Sensei Stephanie and was able to see at first hand just why she had been a world champion. Rarely have I been able to spar with karateka of such ability. Finally we stopped sparring and finished the lesson with some kata (Heian Nidan and then Heian Godan, first slowly to make sure the technique was correct and then quickly, as if performing for a grading). All too soon the karate had finished and it was time to cycle back to my accommodation. I found the rest of my week in Knokke Heist was spent on somewhat of a high. I had been made very welcome by some very decent karateka and had spent several enjoyable hours in their company practicing a common passion. I would like to thank Senseis Wim and Stephanie for such a wonderful time. I look forward to the next time I can visit your excellent dojo (and once again sample some of Belgium’s wonderful beer). PS. I do find it interesting that, though we all share the same karate roots, there can be so many differences in etiquette between dojos. In the UK, it is usually the instructor who gets students to kneel and then bow to the dojo and fellow students and then the most senior student who issues the command “sensei ni rei” (sometimes, bowing to the dojo is omitted). The instructor then issues the command to stand (in English). Yet in the Belgian club, affiliated to the JKA, the senior student issues all commands, including the final “stand” command – in Japanese (kritsu). Obviously there is no right or wrong – they are just different, but it is a curious thing given we all have the same roots. Chinese whispers in a Japanese art, maybe. Since June 2009 I have been fortune enough to regularly visit the south of France as part of ‘my day job’. 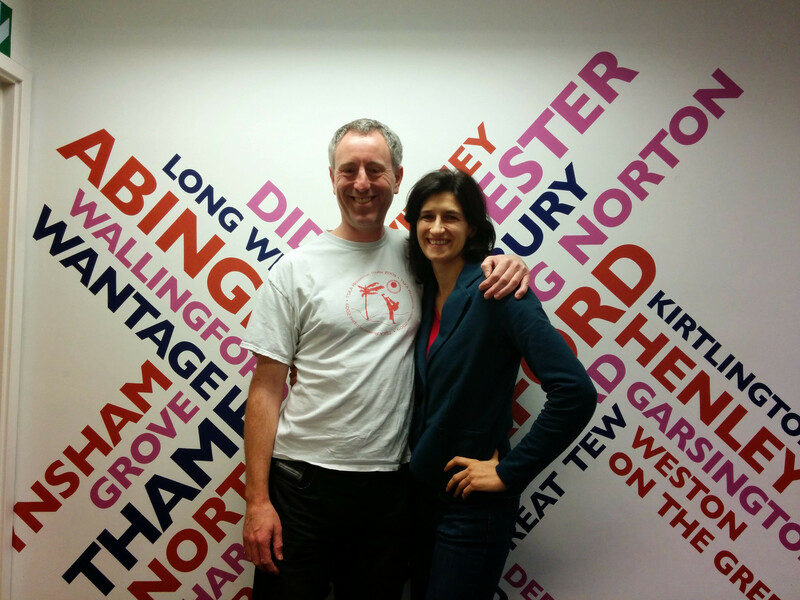 With translation help from Kerry & Big Dave’s wife, Barbara a traditional shotokan karate club was identified just outside Aix-en-Provence (Milles). Contact was initially made by email and an invitation soon followed. From my very first visit I was made extremely welcome and between my extremely poor French, their excellent English, intermittent Spanish and Japanese we have managed to communicate with each other. Sensei Claude Marcou 3rd Dan is the Club’s instructor. His lessons are very traditional/self defence orientated and he pointed out to me at a very early stage that they did not take part in competition training or events. 7 hours of lessons occur per week on Tuesday, Thursday and Saturdays in a purpose built dojo that also accommodates Judo and Kung Fu lessons. The building has changing and viewing areas and a fully matted training area of approximately 9m by 15m. The club is a member of the FKTAMAF – Fédération de Karaté Traditionnel et Arts Martiaux Assimiles en France (The Federation of Traditional Karate and Martial Art Clubs in France). Sensei Irahim El Harhomy 7th Dan is the Technical Director of this organisation (based in Paris) and is the French representative of the ITKF. He was one of the founding members of the Egyptian karate scene and has been affiliated with Sensei Nishiyama since 1970. While at the University of Physical Education and Sport in Cairo he was commended for the development of karate in Egypt. In 1979, he left Egypt and settled in France. He founded his dojo in Paris in 1984 which has 500 practicing members. He has coached the national team of Saudi Arabia, Egypt, and Morocco. He founded his traditional association in 1996 that has nearly 5000 members. He is Chairman of the Commission on Training Instructors and an official representative in international events organized by the ETKF and ITKF. In January 2000, he received the Bronze Medal of Merit awarded by the French Ministry of Youth and Sports for all services rendered. In December 2003 he successfully obtained his 7th Dan awarded by Sensei Nishiyama. 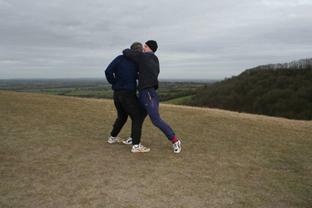 Having suspended dojo training over the Christmas break, the annual pilgrimage to Dragon Hill occurred the day after Boxing Day to blow away the cobwebs. Unfortunately the numbers were disappointingly low, probably not helped by the change in proposed date by Sensei (Sorry Baz and Kerry! ), Karen swapping the muddy windy hill for the comforts of the local gym and John forgetting what day it was! The session focused in detail on Kanku Sho with repetitions being interspersed with bunkai partner work. Sensei pointed out that the order of the kata moves wasn’t an exact sequence for the bunkai response. Rather the kata choreographed various alternative initial responses to similar attacks from various directions (i.e. the first three morote uke moves). The follow up second movement for a bunkai application would then be one of the appropriate handed oi-tzuki aimed at the now tuned, exposed base of the skull. Followed by an optional controlling collar or hair grab with a backwards wrenching of the neck corresponding to the two leading forearm twists (mae ude hineri). Additionally the kata includes contingency responses that may or may not be required. Further more the success of the first bunkai counter attack may in itself render the following sequenced kata move as inappropriate and/or unworkable. A good example of this being the jump following the backhand block (ushiro haishu uke) and ending in the going to ground position (hikui fuse no shisei) on all fours. 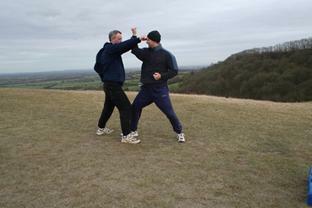 The bunkai application of this sequence could be interpreted as an initial head level block on the inside line and simultaneous leaning away from the strike followed by an immediate crescent kick aimed at the attackers rear leg which if successful causes the opponents upper body and hence head to drop to a low level. The next bunkai move naturally continues with a low level knife hand strike with either leading or rear hand strikes to either the back or side of the neck. The change in kata direction ideally positions both uke-te (defender) and tzuki-te (attacker) for this finishing blow. Alternatively if the crescent kick is blocked/misses the anti-clockwise rotation continues allowing the next sequenced kata technique of ushiro geri to be applied. Alternative bunkai themes based on the manji-gamae and morote tzuki combinations were then practised. As the kata defines, bunkai movement is not only towards the attacker but also a side facing orientation is adopted. A jodan attacked is first parried from the inside line with nagashi uke and the same defending arm subsequently blocks a chudan punch from the attackers opposite hand as the uke-te slides in and classically adopts back stance. 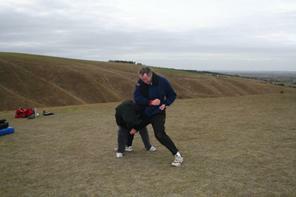 A large circling movement of the leading hand to the rear hip causes the opponent to lurch forward with a shoulder lock being applied. The transfer from back to horse riding stance prevents the attackers leading foot moving forward to counter the shoulder lock. A powerful wrenching of the neck in a backwards direction could then be envisaged corresponding to the kata’s morote tzuki movement. A second theme involved the tuning of the attacker following the nagashi uke using the leverage of a gedan barai on the first thrown punch. Immediately followed by the rear am of the defender circling and initially applying a neck crank with the potential of progressing to a choke. Striking shield drills then followed to keep everyone warm with multi-strikes on alternative angled shields using mae-geri, kekomi, mawashi geri, ushiro geri, gyaku tzuki, uraken, tetsui and shuto techniques. After a short break to share Big Dave’s thermo-flask of sweet coffee several advanced kata were practised; Jitte, Bassai Sho, Nijushiho, Gankaku & Chinte. Despite best efforts the balance and coordination during the single legged stance in the later two katas was a sight to behold in the blustery and muddy conditions. A big thank you to Barbara and Ellie for provide a beautiful warming lunchtime stew and afternoon Christmas game. There are conflicting stories concerning the origins of Ten no Kata. With its repeated use of the Fudo Dachi it was probably defined in whole from a play on various drills by Yoshitaka Funakoshi. There is evidence to suggest that Yoshitaka was almost expelled from the dojo for formulating his own pattern. Apparently in his father’s opinion this was very disrespectful. However at some point Master Funakoshi must have endorsed its inclusion within the original Shotokan syllabus as it was fully detailed in the 1943 publication ‘Karate Nyumon’ (entering the gate of karate) and listed in the first English translated publication of Karate Do Kyohan in 1958 . Within these publications it specifies that Ten no Kata was the product of many years of research and when practised regularly, results in the even development of the body correctly. It is clear to most karate-ka today that Ten no Kata is seldom practised. Its decline in popularity undoubtedly stemmed from the JKA’s stance of disassociating themselves and Master Funakoshi from the Kata. However with its sequencing of punches stepping forward and blocking techniques stepping backwards with counter attacks visually it’s the strongest direct link between kata and kumite and allows the practitioner to fundamentally establish the correct breathing sequences. Partner work of the pattern is known as Hachi Ho Kumite (8 blocks). Counter attacks predominantly (but not exclusively) rely on the bread and butter technique of gyaku tzuki to either jodan or chudan levels. Well I looked out the window with delight, the grey drizzling clouds of the last few days had gone, just as the man on the BBC weather report the night before had predicted. The sky was blue with some wisps of white cloud and the sun was shining. Fantastic. Although it was early I decided to shovel beans and toast into my mouth in an attempt to kick start my body ready for a bit of training, I had deliberately rested my knee (yes that is my excuse) for the last week in an attempt to stop it hurting every time I did a front stance. Looking at the time I knew I should leave, I hadn�t been to Uffington White Horse Hill for some time and wondered how long it would take me to get there. I got in the car and put the tape on and sang along as I am only allowed to do when on my own, the heater was up to full and the temperature gauge didn�t read much above 2 degrees! Anyway, I hadn�t seen the sun for some days and it had been another wet Christmas so I was happy. As I rounded a bend and the song I was happily singing to reached a crescendo, I had to put the brakes on as I came up behind a lorry. A lorry on the Sunday morning after Christmas going my way, great. I arrived at White Horse Hill 4 minutes late. As the training was my idea I thought that this was fashionable but the crew from Wantage standing in the wind seem to think I was a lightweight! I wasn�t the last to arrive and eventually we were ready to go. A light jog up the hill got the blood pumping, but as I looked across the impressive view of my local countryside I realised that there was a large dark cloud heading our way. The wind was getting stronger (I have lived by the Ridgeway all of my life and visit it frequently, only once have I ever been up there without a wind) and it was bitingly cold. We stopped half way up for a quick couple of Heian kata and then continued our jog to the top. Just before the hill fort itself, where the incline becomes much steeper we stopped again for another kata and as soon as we finished we raced, in a manner of speaking, to the top. Standing on top of a hill fort a couple of days after Christmas with a wind (that must have had a very large negative number as its chill factor) rushing over and through my body, something occurred to me. My lack of exercise of late (remember I was resting my knee) had made me feel rather tired, well more than tired, I was already knackered! But I decided we must carry on as it was too cold to stop! After another kata we broke out the pads. As organiser I had managed to avoid carrying them up the hill, and we started punching them. It was so cold up there I couldn�t feel my hands, or at least I thought I couldn�t till I did something to my finger, oh yes I could feel it then. 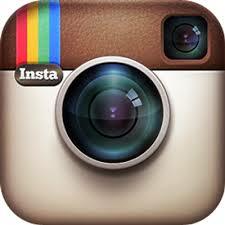 I�d caught it a week or so before and now I�d done something more to it. After checking it wasn�t broken we decided to carry on with kicking. Front kicks, side kicks, roundhouse kicks, back kicks, it is interesting to see peoples technique change when the floor is muddy slippery and covered in sheep droppings. Then we decided to go for the jumping front and side kicks, I was glad it wasn�t my pads that were being redecorated in faeces! Then I slipped as I did a flying side kick and twisted my ankle, not badly mind you, and as I thought how this had been a stupid idea, it started to snow. Yes snow. I didn�t see Michael bloody Fish say anything about any snow. It wasn�t heavy and it wasn�t settling, but it was snow. So then we put the pads away and did some one step sparring, I though it may give people an idea of how differing ground conditions could affect the way your techniques are delivered. 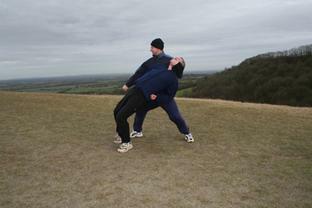 This obviously gave Paul an idea as he then started doing take downs and grappling his partner. The enthusiasm caught and we were all doing it, luckily today�s washing powders can deal with all types of stain! When we had managed to roll around in everything we could find we decided to do another kata or two before heading off back down the hill. As we did the wind and another flurry of snow laughed in our faces which I am sure had frozen into masks of pain by that stage. We said goodbye to the two die hards (idiots) who had cycled up and jogged off down the hill stopping for another kata or two. Then we jogged off to the car park and out of the killer wind. Back in the car park I eagerly accepted some tea from someone who really deserved a medal and wondered if I�d ever feel my hands again. After a photo and a bit of a chat it was time to go home to get back to Christmas couch potatoism that I had for some stupid reason shunned for the last hour or so. Eventually I got home and warmed up, my finger was OK but the back of my hand was heavily swollen for a couple of days. I think the others enjoyed it as well, in a strange sort of way. Now all I need is an idea for next year.